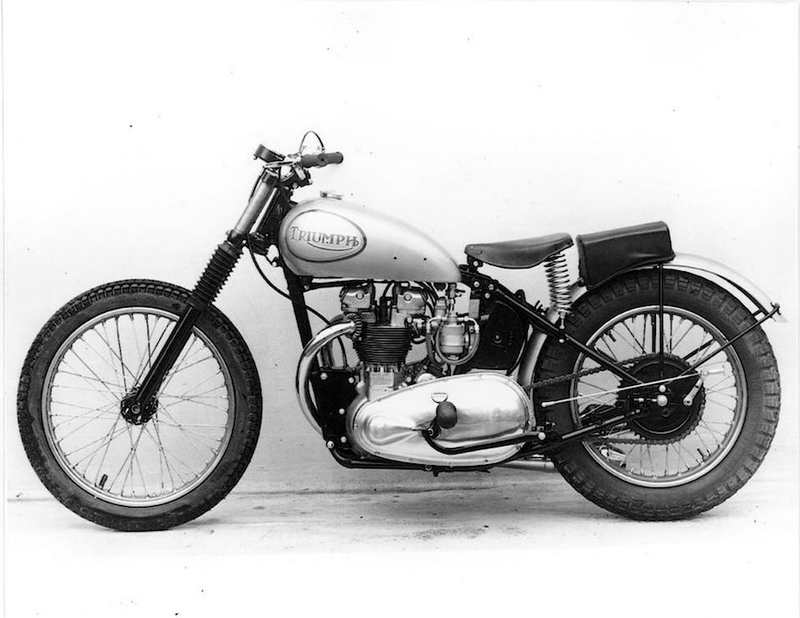 It may be brief, but the letter gives us a glimpse of the links between Triumph’s Managing Director Edward Turner, his American friend Bill Johnson and the special racers built to take on the might of Harley-Davidson in flat-track racing. Here is how it happened. Class C racing started in 1933 when the American Motorcyclist Association’s top brass realised the glory days of exotic eight-valve Harleys and Indians duelling for dirt-track supremacy was over. The Great Depression had ripped the guts out of the American motorcycle industry and the AMA decided the only way to get more people racing was with an all-new formula. Class C bikes had to be based on standard production models and with at least 100 units sold before the model was approved for racing. And to keep Harley happy, side-valve Flathead engines could have a 250cc capacity advantage over the 500cc overhead-valve bikes. 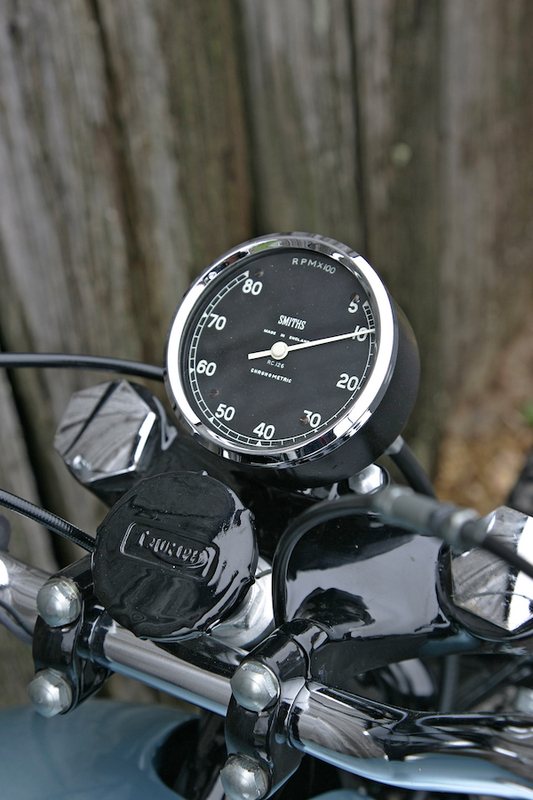 Compression ratios were limited to 7.5:1, which didn’t effect the Flatheads, but would limit the performance of the OHV engine tuners. The original rules also stated that once the rider changed into top gear, he had to stay there. That was just another way to help the hand-shift Harleys stay on the same lap as the foot-shift European imports that were making their way across the pond. In 1938, over on the West Coast, Bill Johnson bought a motorcycle dealership in Pasadena called British and American Imports. He started promoting Triumph by sponsoring riders in Class C and, two years later, Boo-Boo Pearson became the top Californian rider after thrashing the opposition by winning 32 out of 36 races on his tuned Tiger 100. Edward Turner wasn’t interested in racing, but Johnson was passionate about the marketing potential and he imported as many Grand Prix Triumphs as he could get his hands on. The GP production racer – the bike based on the mongrel Ernie Lyons had raced to victory in the 1946 Isle of Man Manx GP – used a modified sprung hub Tiger 100 chassis. 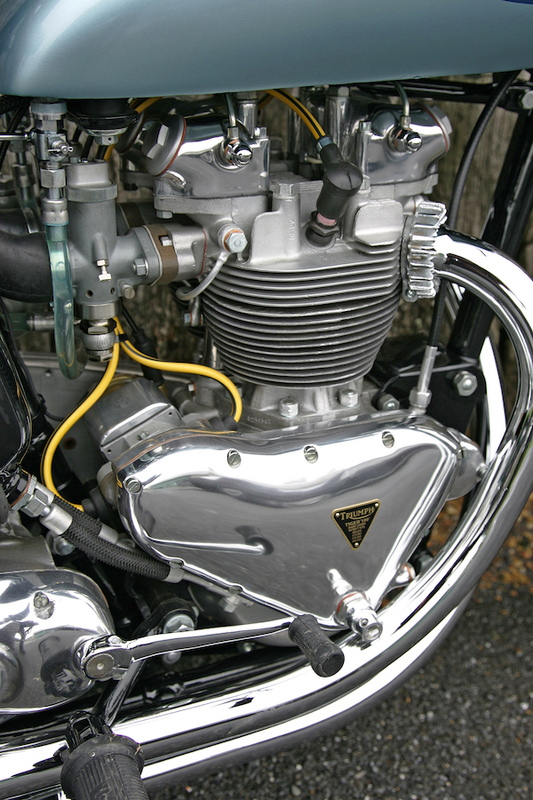 The engine was basically a T100 bottom end but with a lightweight alloy cylinder block and head derived from a wartime generator, which was why both inlet and exhaust ports were parallel to each other. With twin Amal carburettors fed by a remotely mounted float chamber and megaphone exhausts, dropped handlebars, eight-inch brakes, alloy wheel rims and mudguards, and a 15-litre fuel tank with quick-action filler. The Class C rules now allowed 8.0:1 compression ratio and the GP was good for over 190km/h and dyno tested at 40hp (30kW). GP Triumph production stopped in 1950, but things started looking up when the new T100 was announced before the year was out. With a close-finned die-cast alloy barrel and head sporting bigger inlet valves and 7.6:1 compression pistons, the Tiger delivered 32hp (25kW) and was good for 155km/h. Turner’s head salesman Pete Colman, who was also a top engine tuner, had already designed hot-up kits for the 650 twins. 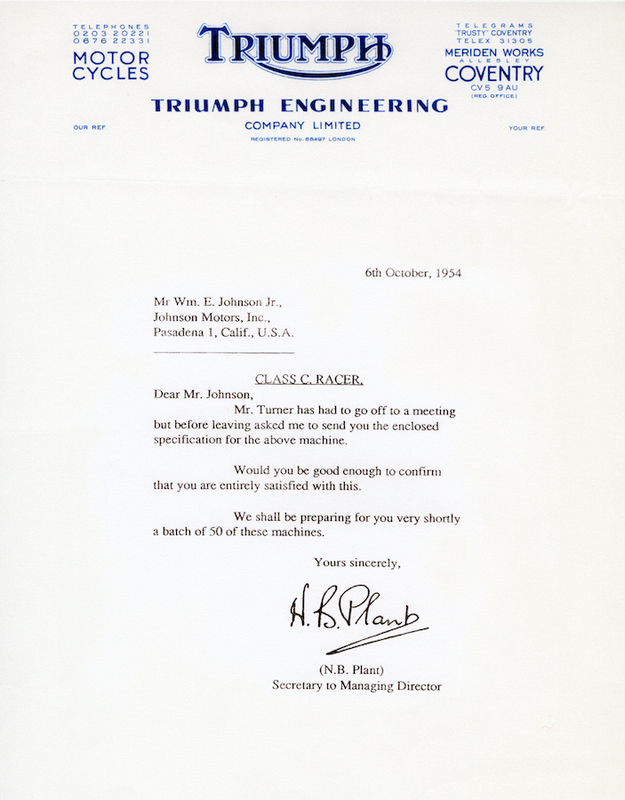 He liaised with the Triumph Experimental Department to come up with a box of goodies that would be available from 1951 and sold only to T100 owners who could supply their engine and frame numbers. And no wonder, the racing kit was available at half the price of what the parts were actually worth. Shipped in a stout timber box along with detailed fitting instructions, the kit included high-compression pistons, high-lift E3134 camshafts and racing valve springs, a pair of one-inch bore Amal Type 6 carburettors with a twin-port manifold and a remote float chamber, twin throttle cables, a junction box and reinforced petrol pipes, a Smiths 8000rpm tachometer, a 3.7-litre oil tank to replace the stock 2.8-litre one, two 1.5-inch diameter exhaust pipes with four-inch megaphones, downturned handlebars, a folding footpeg and kickstart lever, race number plate and sundry gaskets. And they were right – race-kitted T100s thrashed Harleys on flat-tracks and TT scrambles and Triumph even offered a T100 with the kit factory fitted. Available for 1953 only, the roadster T100C was advertised as “Exciting News for Racing Men” with a reminder the Tiger 100 held the American Class A 500cc speed record at a phenomenal 216.6km/h (134.59mph). Then came the 50 Class C racers promised in Nancy Plant’s letter which were quickly snapped up by racers. The specification sheets Nancy included with her note to Bill Johnson explain why. The frame was a standard rigid TR5, as was the fork, the fuel tank also came from the TR5 parts bin, but without the chromed parcel grid or rubber knee grips, and the oil tank was rubber mounted. There was a new dirt-track 3.00 x 20-inch WM1 wheel up front with a spool hub, and a 4.00 x 18-inch WM3 wheel at the rear. 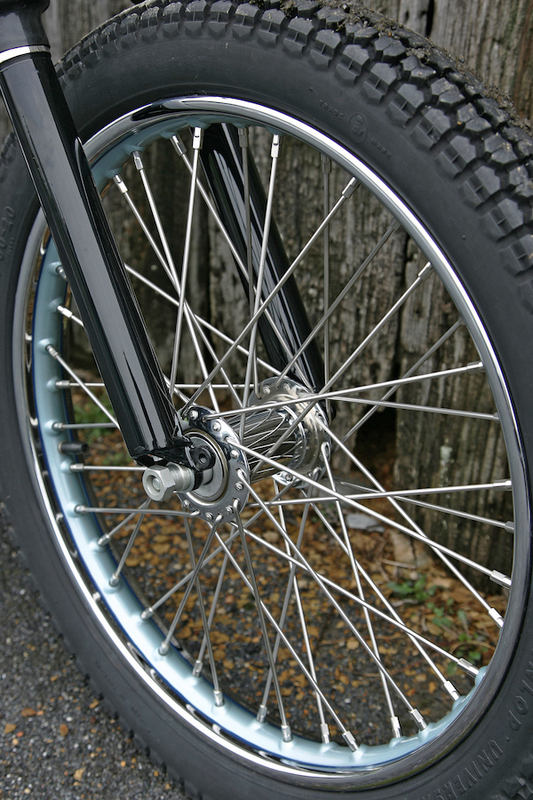 Both rims were shod with Dunlop Universal tyres but, as this was a purpose-built flat-track race bike, there was only a rear brake, and no front brake fitted. Dunlop also supplied the racing saddle with springs from old 3T stock, while a pillion pad was mounted on the rear mudguard so that the rider could slide back into a racing crouch on the straights. There was no front fender. The gearbox was filled with standard ratios although optional ratios were available, the clutch was a stock five-plate assembly, while the engine came fitted with a 19-tooth sprocket. The engine had all the race kit goodies. Conrods were standard, with the latest type of big bearing crankshaft, racing camshafts were matched with larger-radius racing tappets and it boasted bronze valve guides and springs. 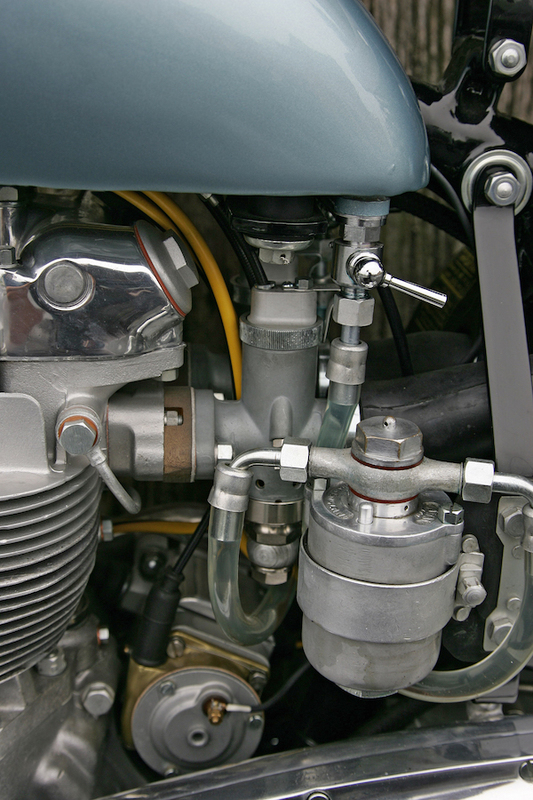 The inlet manifold had sleeves that were stepped into the cylinder, while a matched pair of DS and TS Amal track carbs were fed by a top-feed float bowl, rubber mounted on the left. An Amal twistgrip replaced Triumph’s own, as did a larger Vokes air filter and, as flat-track courses ran counter-clockwise, both narrow-bore race pipes exited on the right. 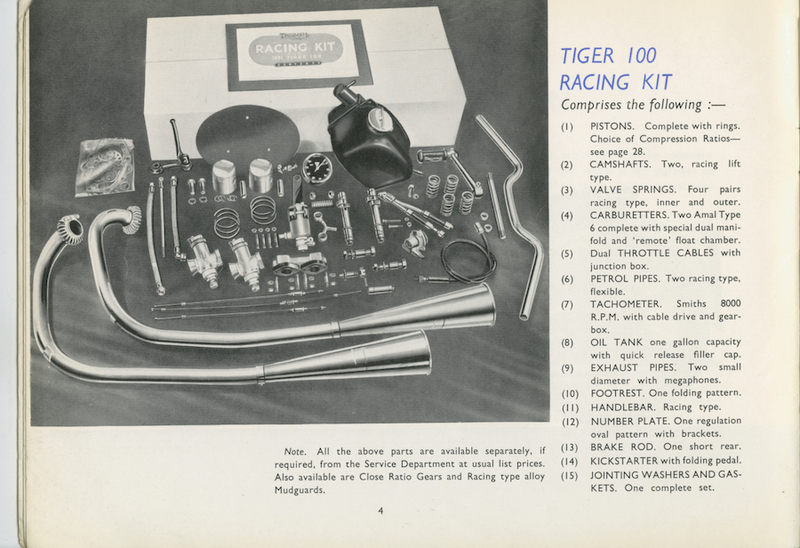 Other track goodies included a Smiths 8000rpm tachometer, and a manually controlled BTH racing magneto – Lucas, Triumph’s usual supplier, could not supply non-standard equipment when the first batch of 50 racers were being built. With a top speed of 185km/h and weighing in at 139kg ready to race, the T100/R was a sure-fire winner. And because it wasn’t weighed down with a rear chain guard, number plate, lights, tools, battery, sidestand, front brake or front mudguard, Johnston was able to offer it for $785 at the time, a full $81 cheaper than the fast roadster. 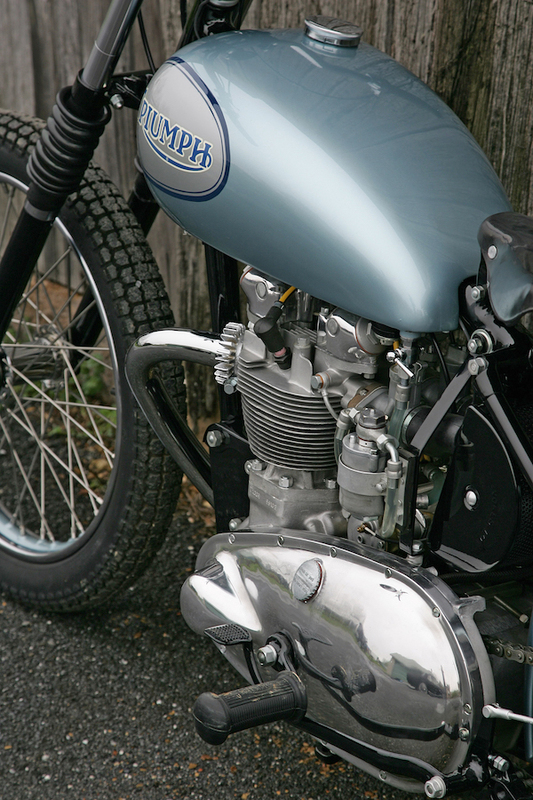 Triumph factory records show that only 134 T100/R Class C racers were built, along with 16 extra engines and another small batch of flat-trackers, designated T100/RR, were shipped to the US in 1957. 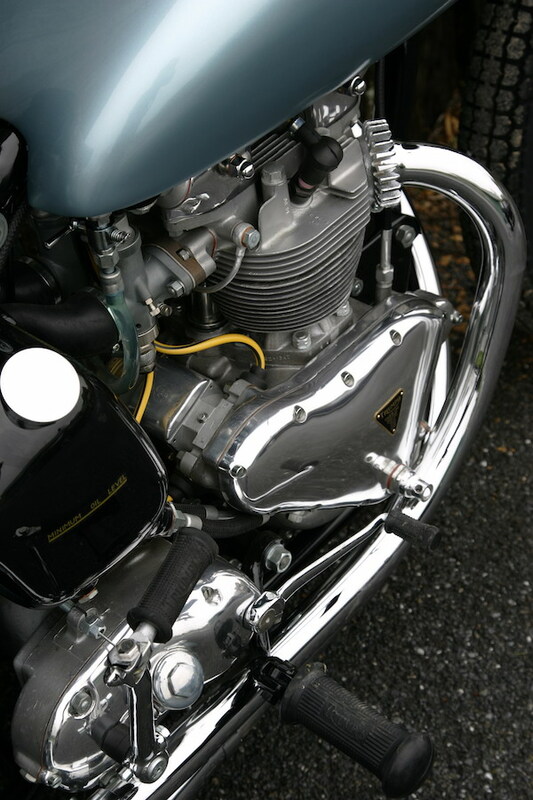 They featured twin rubber-mounted Amal GP carbs on a new Delta alloy head, which eliminated external oil drain pipes, but more importantly had splayed inlet and exhaust ports, instead of the earlier parallel-port design. That was the last of the factory T100 flat-trackers. They were handsome bikes that were easy to maintain and with the potential to win straight out of the crate. No wonder they are some of the most sought-after Triumphs ever made. Nobody in their right mind would attempt to build a 1955 T100/R that was correct right down to the last nut and bolt if all they had to start with was a frame and most of an engine. But John Melniczuk did. 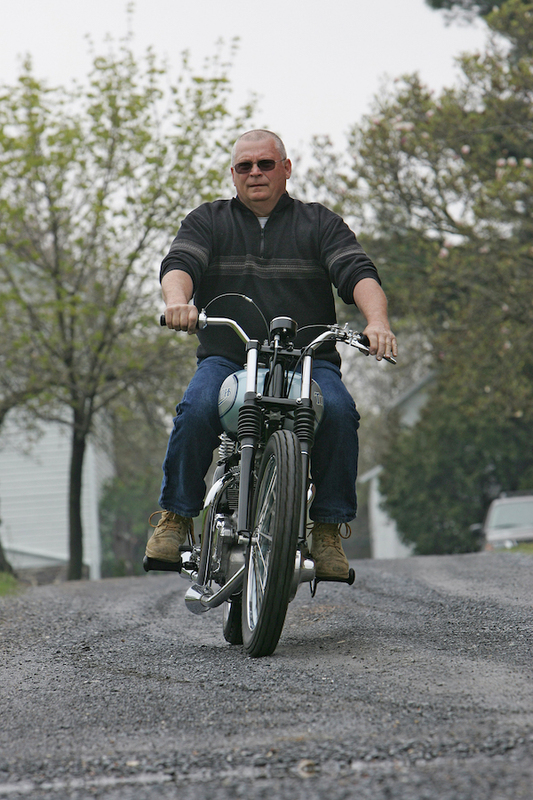 His father ran New Jersey-based Triumph dealership Bauer Cycles from 1952 to 1983. “Dad used to sponsor some of the faster dirt riders with a loan of a bike and travel money,” recalls John. “I remember the T100/R parked in a corner of the shop when it was pensioned off, Dad took the motor out and used it in a drag bike. But the frame was always lying around. John started on a mission to build the best T100/R in the country. 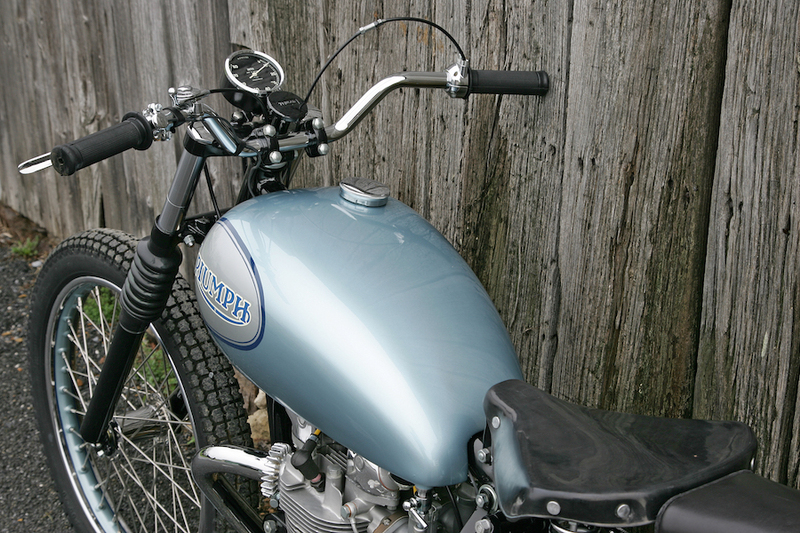 He was told of an original, unused left side cross-over exhaust pipe hanging in a garage in Connecticut, which he grabbed, as well as a beat-up fuel tank. It still had the large decals, although the petrol taps were positioned at the back of the tank, not on either side. John shipped the tank to a Canadian metalworker to have the taps moved and dents beaten out. Then he had another stroke of luck – a customer of the metalworker recognised the tank as one off a 1957 T100/RR, he owned both 1955 and a 1957, needed a tank for the ’57 and had a ’55 one to swap. He also lent Melniczuk a Vokes air filter to copy, while another friend found him a pair of race kit carburettors and lent him an intake manifold. 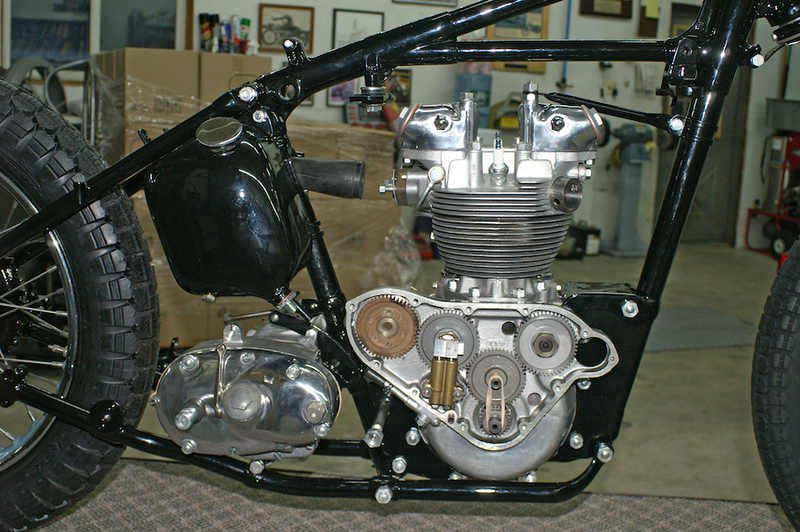 The carbs were shipped to Surrey Cycles in England for refurbishment, while the manifold went to Australia, where a phenolic resin mould was made for a cast-alloy replica. 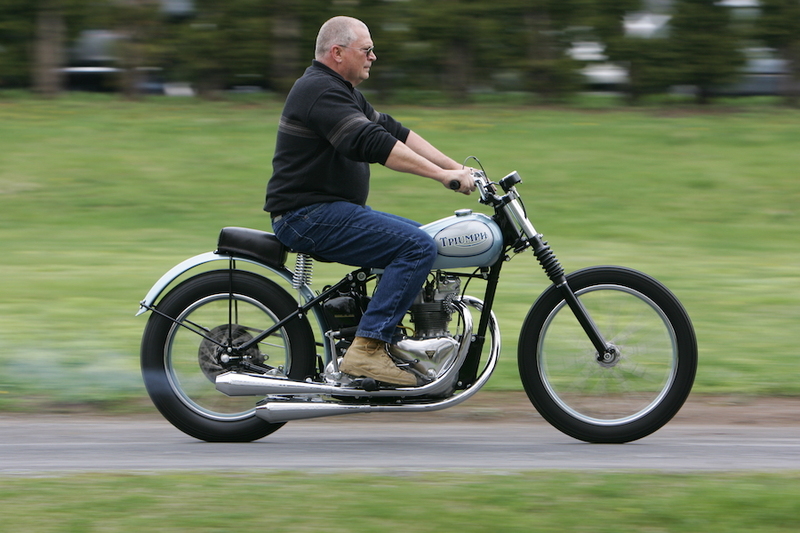 He sourced a magneto, he had a tacho built by a mob in New York and, while the 20-inch front wheel with its spool hub was unique to the Triumph flat-trackers, he found one on eBay. Remarkably, from a discarded frame to the bike on these pages, the complete restoration took John just eight months. “This bike was meant to be,” he said. “Everything just kept coming together and Dad says it looks better than it did when it left the factory”.